Saturday night chin wag over a glass of wine at my friends house, supposedly post kids bedtime but we were entertained by her restless toddler for the first hour and another friends non sleeping baby for a lot longer. 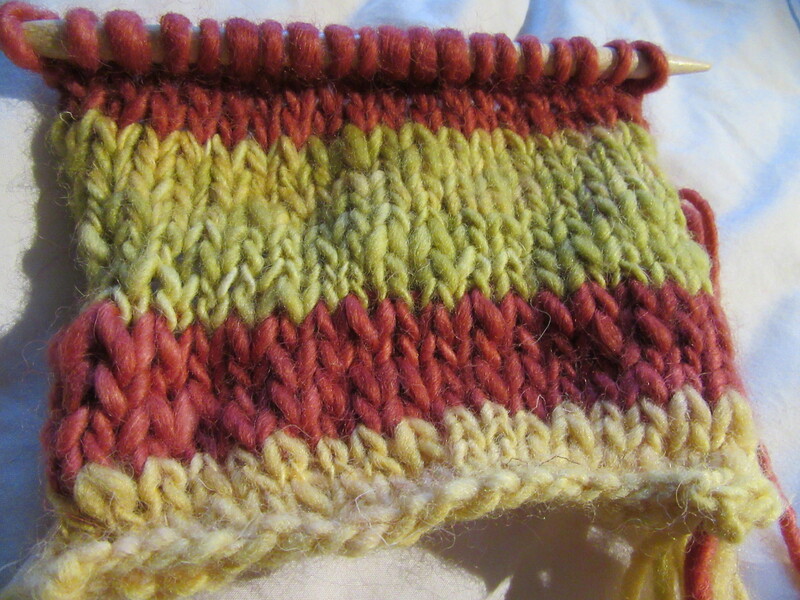 Inspired by Jen from Grainline’s post about a Sunday Sweater Knit Along I took some yarn from a project I never seem to start to knit up a tension swatch for. But there was still my circular needles in my knitting bag from when I went away and two balls of Blue Face Leicester Aran wool in green. 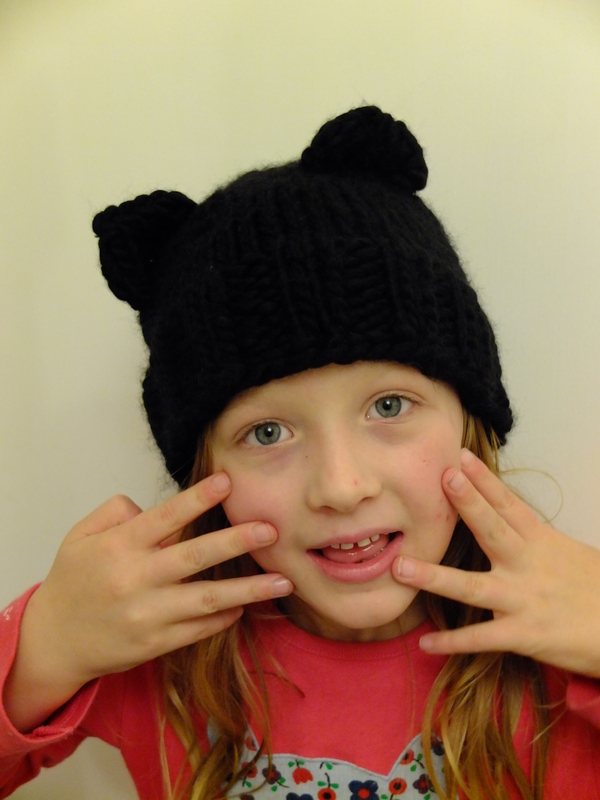 So I knit a hat instead, with basket stitch sides (I took a vote on the sides, only one person voted as the other 2 don’t knit, so basket weave it was then). 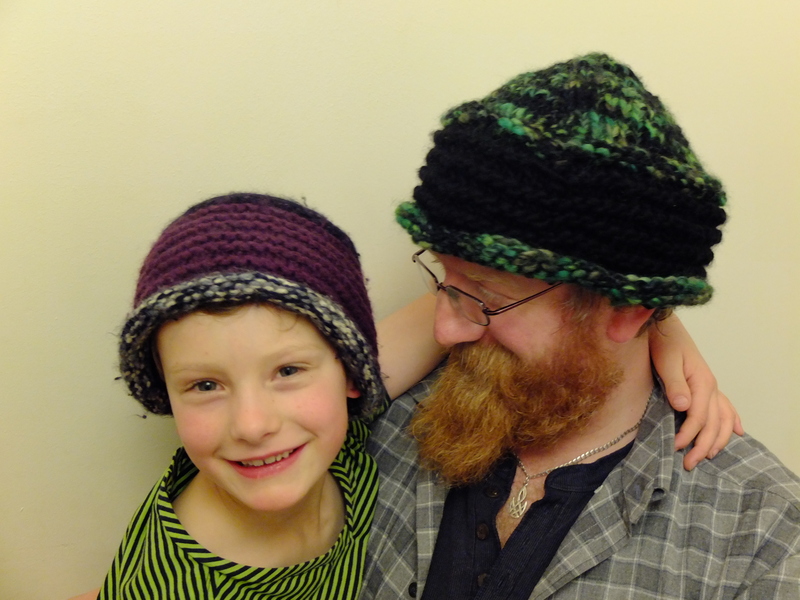 It’s very similar to the last hat I knit, but plainer. Now to find a home for it. With someone who wont accidentally felt the wool. 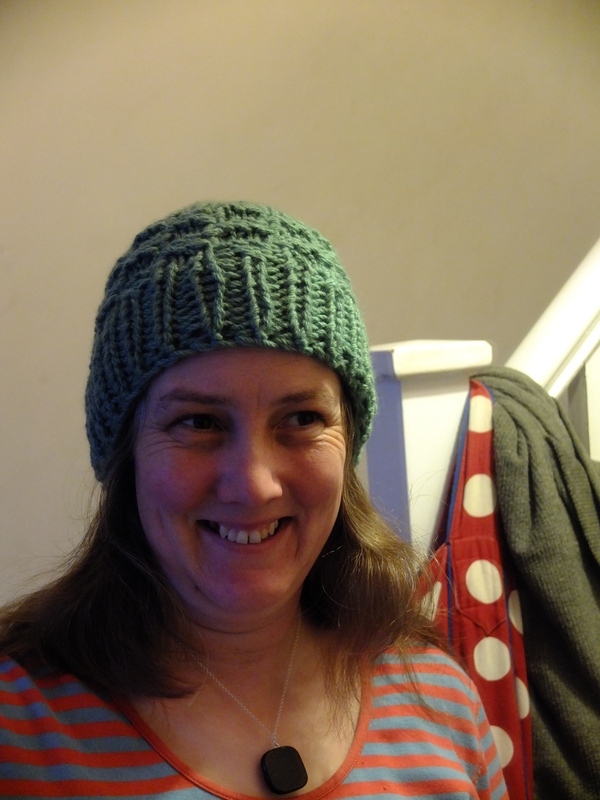 Although, despite it not being my usual colour, I quite like how it looked when I modelled it for the photo’s. It did ride up though as it’s a bit small for my humungeous head. I did do a spot of tension knitting today. As I suspected, I need to buy new needles (the pattern asks for 5mm, I only have 5 1/2mm and they’re too big, I’ll probably need to buy more for the rib too, oh well). I also re read the post, and it’s not, as I thought, a KAL where you knit of Sunday afternoons, but rather you knit the kind of jumper that would get worn on a Sunday afternoon. So maybe a school friendly cardy for a boy is not really a good fit for the KAL, but it doesn’t really matter. 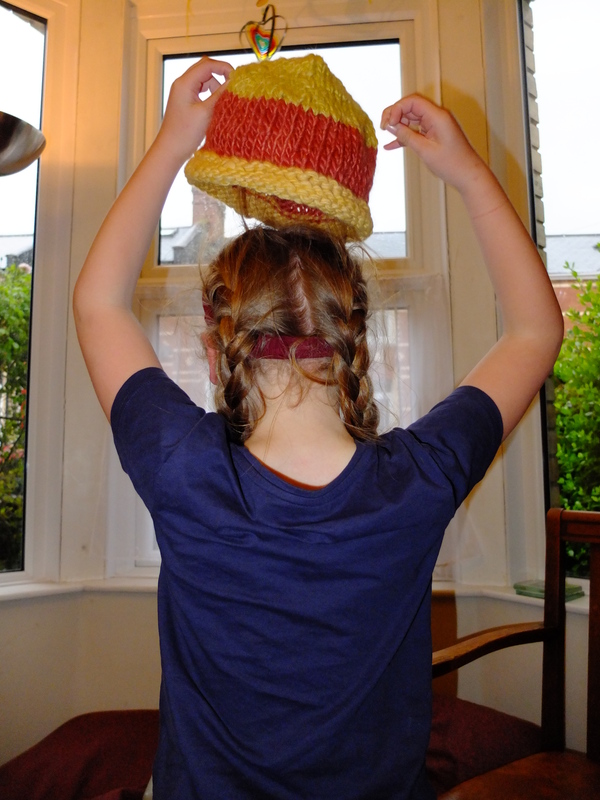 This weekend I have mainly been knitting hats. OK, so that’s not exactly true, I did lots of other stuff too (especially eating), but I did have a couple of 3 hour train journeys to make and had some free time (without kids) when I was away and hubby did point out just before I left that the hat I knitted him about 3 years ago had shrunk and he needed a new one. So I set off with a set of double pointed needles a ball of lovely green and black Monello trend Adriafil Wool/Acrillic blend, which is a yarn which is slubby and fat in places, plus the end of a ball of black acryllic aran weight, both from my stash, both approved by hubby. I’d dug out some rough notes on how I used to make them (pre sewing renaisance, pre blog) and I set to work on the train, hoping my fingers would remember what to do as the notes were pretty sparse. 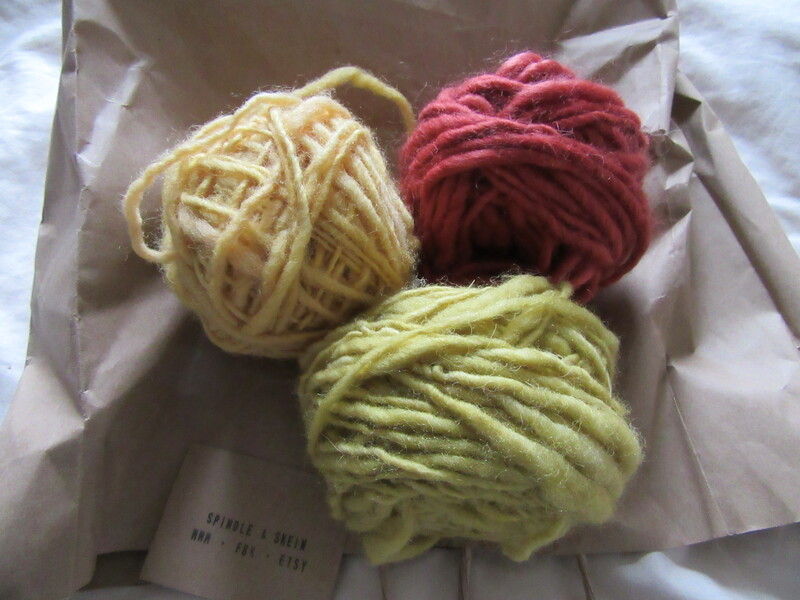 It became apparent before I arrived in Birmingham that I wasn’t going to have enough yarn (I was knitting it double stranded so the aran bulked the more expensive yarn out). My very patient, non sewing/crafting friend met me from the station and accompanied me round the rag market (there was one yarn stall which had nice stuff but nothing suitable for this emergency) and then escorted me out to Guthrie and Ghani. It was there I managed to pick up some plain black Rico Essentials Super Chunky virgin wool/acrillic (don’t be fooled by the Essentials tag, this was definitely not cheap and cheerful, more expensive and luxiurious) which was just the right weight. 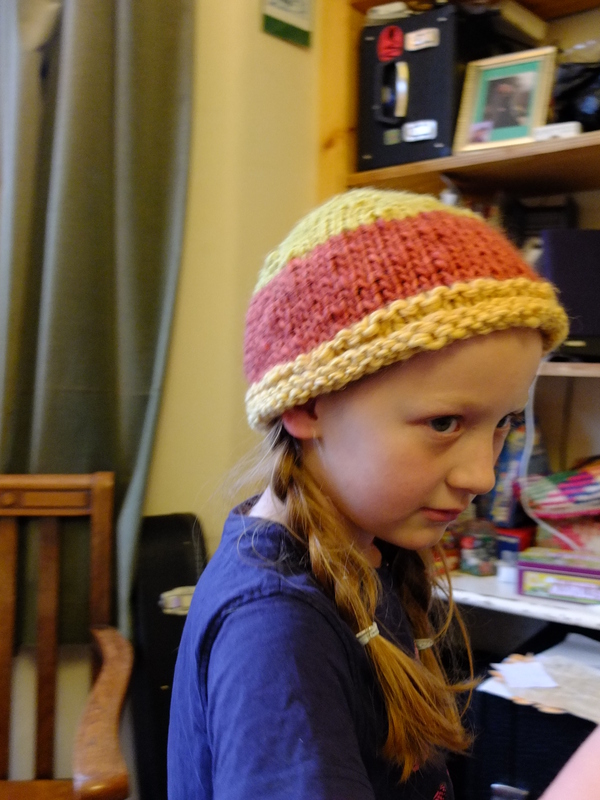 I had the hat finished well before the end of the weekend (bar some minimal darning in of ends, I love the lack of sewing up when you knit in the round) and had a few conversations knitters and non knitters about what I was doing too. But then I had most of a ball of lovely soft black yarn left so I started another hat, which I finished on the train journey back. This one is going to be a present, so shh, don’t tell anyone. 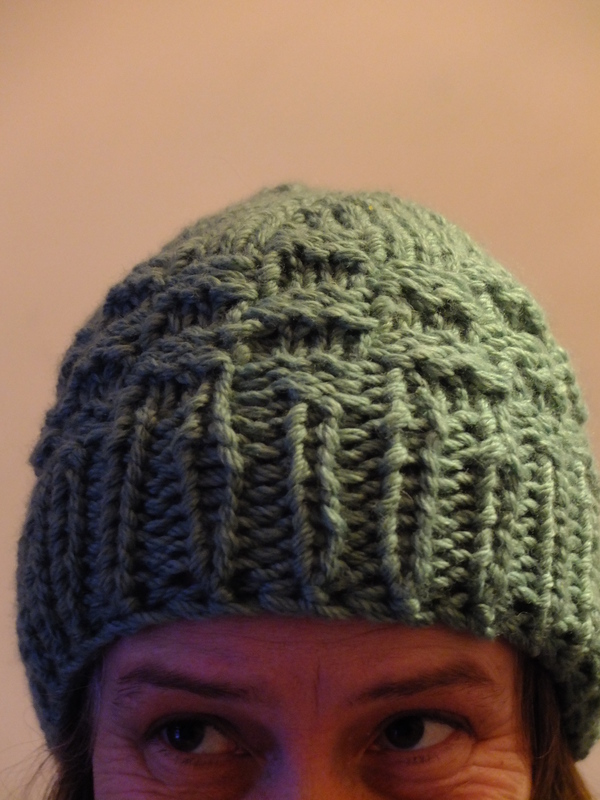 Now I’m on hat number 3, not sure who this one is for. 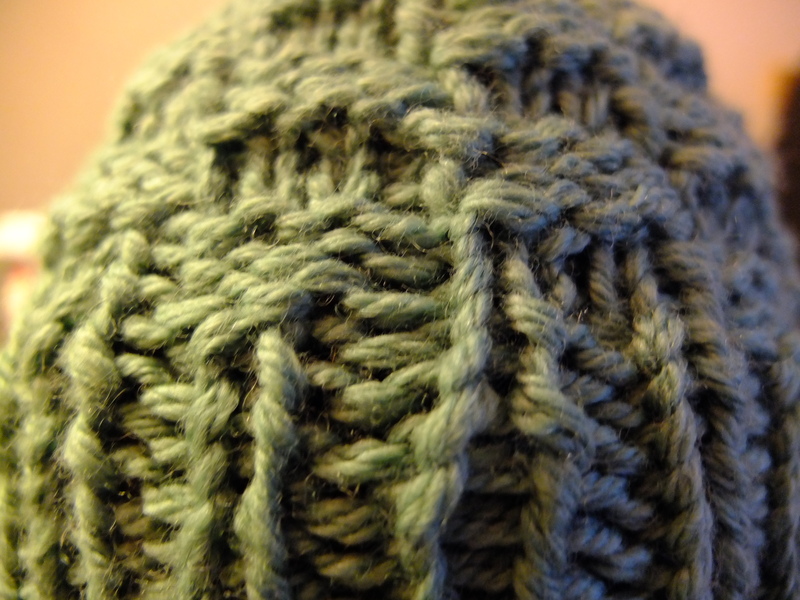 I’m sarting to remember how addictive hat knitting is. But I can stop anytime I want. Anytime. Honest. Oh, and I may have bought a little fabric and notions whilst I was away too. Modest Haul. Spotty Cordrouy, stripey jersey, clear elastic, cat and heart buttons all from Guthrie and Ghani. Lacey ribbon, fancy trim and what will hopefully be suitable purple knicker elastic, all from the Rag Market.